Waterproof carpet isn’t a thing of the future anymore - it’s reality! The most common carpet complaints I hear relate to staining, mold, mildew or pet smells. Well, worry no more, waterproof carpet is here to change your life for the better. You’re lounging on your couch, reading the latest tweets from Moonpie (wait, that’s me), I mean...reading the latest from Floor Trends Magazine (that’s better), and from around the corner you hear a crash, you hear a bark, you see a large dog sprinting your way… and alas! There goes the coffee table, and there goes your summertime sangria. Summertime sangria on the carpet used to be a red stain to gaze forlornly upon for the rest of your life. Luckily, you have waterproof carpet and all that red just dances on the surface, ready to be blotted up with a paper towel. No, for real, it is. Let me show you. It would be easy to say that waterproof carpet was magic. But it’s not magic, it’s science. Shaw is leading the industry on residential waterproof carpet. With their patent RX2 technology and Lifeguard backing, nothing penetrates their waterproof carpet. Perhaps more important than me saying that is telling you what it means. So what is RX2? Well, it’s a stain and soil repellent that protects carpet fibers from dirt and spills. This resistant system has total fiber coverage and offers complete protection of the whole carpet fiber. What’s truly magical is the fact that spills that reach the base of the carpet get wicked back to the surface, which is why that summertime sangria can be easily blotted up. So what’s Lifeguard? It’s the backing the seals the deal when it comes to waterproof carpet. This backing is made from 100% thermoplastic commercial grade backing. No liquid will penetrate that. Don’t believe me? Believe this swimming pool made out of Shaw’s waterproof carpet (in the video above). 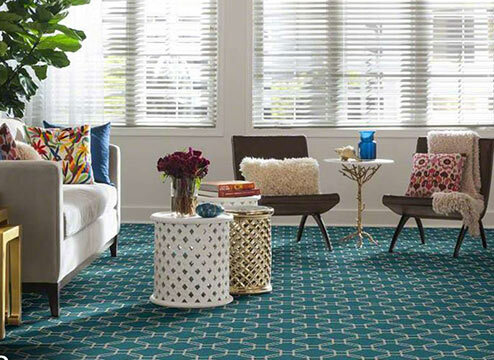 These are great qualities for an indoor outdoor carpet! However, water resistant is not the same as waterproof. They don’t have the special Lifeguard backing. 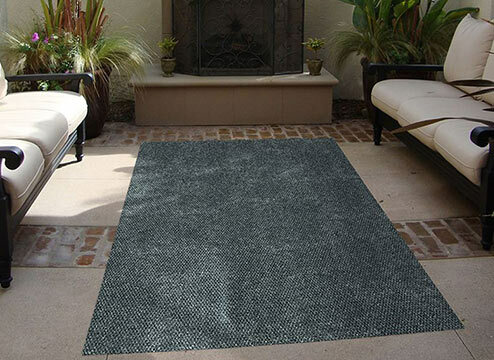 Most indoor outdoor rugs are made from Eco-fi, a 100% synthetic recycled fiber. Recycled consumer grade plastic bottles make this fiber! This polyester fiber has natural water-resistant and stain-resistant properties that make it great for the outdoors. 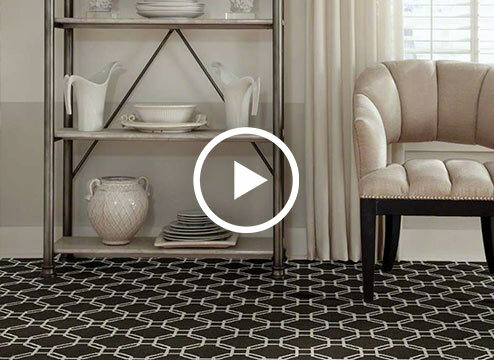 If you’re looking to cover a space with an area rug, a water-resistant one is the way to go. No mold and mildew worries: Relax, this carpet has got you covered. 100% waterproof: Your subfloor and carpet are protected by this technology. Bye bye, stains! Soiling and staining is a thing of the past. 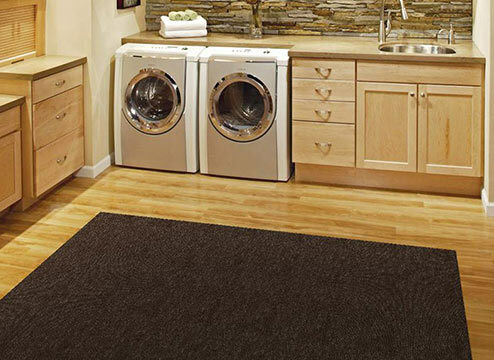 Waterproof vs. water resistant: Make sure you’re getting the carpet you want! The cost factor: Waterproof carpet does have a few more dollar signs attached to it than other carpet types, but to not have to stare at a stain for 20 years... I think it’s worth it. You can install carpet rolls two different ways: stretch-in and with adhesive. Both methods require a stretcher (which can be rented), knee kickers and melt tape for seaming. I’ll outline how the two methods work, and then you can decide if you want to hire a professional. For this installation, adhere the seams together using melt tape or another adhesive. Then stretch the carpet in place using a power stretcher or knee kicker. Attach the carpet to wall tracks that secure the stretched carpet. 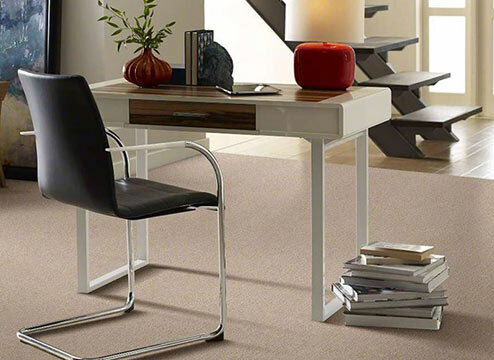 Stretched carpet is less likely to sag or have air bubbles when installation is complete. With this installation, the carpet is glued to the floor. It sounds easy but is actually extremely tricky. You must also have a knee kicker or a stretcher in order to ensure a smooth carpet, free from air bubbles. To prevent air bubbles, lay carpet from the center and work outwards from both directions. You may also roll the carpet with a 75 lb. roller in both directions if it’s directed by the manufacturer. 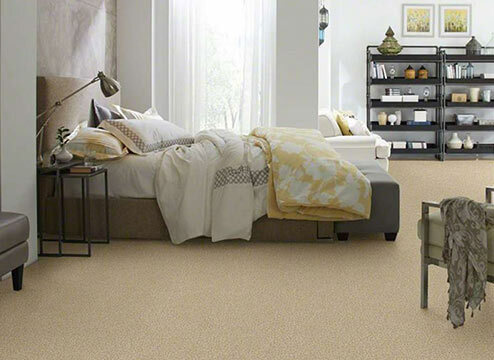 With all this info, it’s easy to see why waterproof carpet is the best of the best. If you’re someone with a carpet complaint, consider the issue resolved. Waterproof carpet has got your back.